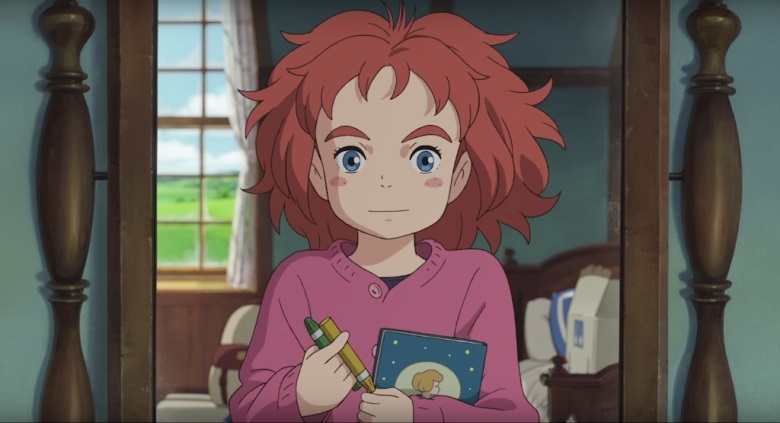 Studio Ponoc’s animated fantasy adventure Mary and the Witch’s Flower will be released in cinemas across the UK from the 18th May 2018; that is according to a report on AnimeNewsNetwork via the launching films website. Animated by Studio Ponoc and directed by Hiromasa Yonebayashi , who has previously worked on Studio Ghibli’s animated feature When Marnie Was There, Mary and the Witch’s Flower is a feature-length-anime that follows Mary and her new found friend Tib as they begin an adventure within the woods. The flm will also be dubbed into English and will feature the voice talents of Kate Winslet and Jim Broadbent . Synopsis: It is Tib the black cat who leads Mary to the strange flower in the woods. When she discovers a little broomstick shortly afterwards, she is astonished to feel it jump in to action. Before she can gather her wits, it is whisking her over the treetops, above the clouds, and in to the grounds of Endor College, where: ‘All Examinations Coached for by A Competent Staff of Fully-Qualified Witches. We can expect further details for Mary and the Witch’s Flower UKto be confirmed next year; but for the time being we can expect to see the film available in UK cinemas from the 18th May 2018. We always seem to be the last country to ever get to see these releases. listening to the whole world telling you how great the movie is while you have to wait months to see it for yourself is only going to encourage piracy!